Sometimes it’s easy to lose the wood for the trees: to forget the fundamentals and think only of the outcomes. Suspension is one area where that happens a lot. So let’s take a step back and think about springs. Nearly all current cars use steel coil springs. The springs are there to support the weight of the car’s body while still allowing it to move up and down – or, more accurately, for the wheels to move up and down while the body stays still. Springs vary in their rate, that is, how much they compress for a given weight placed on top. Put 1 kilogram on top of a vertical compression coil spring and its height might be reduced by 1mm. In that case, the rate of the spring is termed 1 kg/mm. If you put 2kg on top of such a spring, it will sink by 2mm. Put 20 kg on top of the spring and it will sink by 20mm. And so on. Rates of springs are also often expressed in pounds per inch, but the same idea applies. The amount the spring compresses with the car’s 250kg weight on top (this is called the static compression) is determined by the spring rate that we chose. 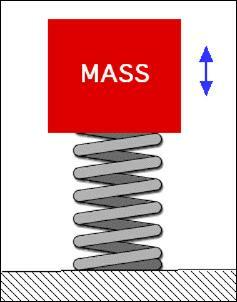 So, with 250kg on top of each spring, a chosen spring rate of 1 kg/mm will result in the spring compressing by 250mm – or about 10 inches. Remember, that’s where the car sits in its static position – to cater for bumps in the road, we’re going to need the spring to still have plenty of travel left. And with 250mm of static spring deflection, arranging even more travel is going to be difficult unless the car has a way high ride height and an incredibly long travel suspension. So let’s stiffen the spring rate to 3kg/mm. Now, with the same 250kg acting to compress the spring, it will shorten by only (250/3 =) 83mm, or 3.3 inches. If we have a total suspension travel of 200mm (8 inches), that will put the car 40 per cent down the full suspension travel when it’s sitting there, unloaded. (So what’s ‘full suspension travel’ then? Full travel is the vertical distance from maximum bump [that’s the suspension as compressed as possible] to full droop [which is when the suspension is as extended as possible, the entire car’s weight off the springs] . With the suspension compressed by 83mm of the available 200mm, there seems to be plenty of room for further travel to absorb bumps. And in fact, even if the static weight of the car doubled (ie there’s 1g of upwards acceleration over a bump), only 166mm of the available 200mm travel would be used up - so there would still be some left over. Trouble is, this analysis ignores the weight of passengers and luggage. If the unloaded compression of the springs (with 250kg acting through each) is 83mm, add four people at 100kg each and the suspension travel that's used up increases to 117mm - that’s 117mm of the available 200mm. If you now hit a 1g vertical bump, there won’t be sufficient travel left to absorb it. That’s why 1000kg cars with four 100kg people in them don’t like big bumps...and why bump stops are a prerequisite! So why use a suspension rate that deflects by so much with just the static weight? Why not use a stiffer springs that allow more room for bump absorption, even with our four 100kg people on board? There are two parts to that answer. The first is that in addition to bump absorption capability, you also want rebound travel – that is, you want the wheels to stay in contact with the road when the car meets a hollow in the road. The suspension must be able to droop sufficiently for the wheels to do this – and also enough to keep the inside wheels in contact with the road when body roll occurs in cornering. If you have a static ride height only 10mm down into the travel, you’ll have (in a worse case scenario) only about 10mm of droop capability. But the most important reason why you want to use springing that allows plenty of static deflection is because of what is called natural frequency. Imagine a coil spring out of the car sitting vertically on the ground. You place a weight on it (yep, the spring deflects proportionally with its rate) and then you carefully push the weight downwards and release it. The weight will bounce up and down at the spring’s natural frequency. Over time the bounces will die away (they’ll get smaller) but they’ll continue to occur at a certain number of cycles per second, or Hertz (Hz), until the spring is still. The same applies to springs in a car suspension system – the suspension has a natural frequency of up/down bounces. Importantly, the fact that you might have dampers in the system makes very little difference to the natural frequency! When thinking about suspension systems, natural frequency is almost never considered. However, it is vital for two reasons. Firstly, in terms of ride comfort, the human body likes to sit on a system that has a natural frequency of about 1Hz, or 1 up/down cycle per second. Secondly, as the natural frequency of the suspension numerically increases, it gets excited far more easily by road bumps, making control of the spring more difficult. In short, a lot more of the vertical accelerations of bumps get through to the cabin. So what determines natural frequency? For a given car it depends on how much the springs compress when the static weight of the car is lowered onto them. And is the natural frequency number easy to work out? Yep! The natural frequency in cycles per minute (divide by 60 to get Hertz) can be found by: 188 divided by the square root of the static deflection, measured in inches. So in our example above, we ended up with a static deflection of 3.3 inches. This suspension therefore has a natural frequency of 1.7Hz. That’s quite a long way above our optimal-for-ride natural frequency of 1Hz, but the only way of getting a lower number is to increase the static deflection, which in turn means we need to have a greater total suspension travel if we’re still to be able to absorb bumps. Some of this we know intuitively – we’ve just never thought about it in detail. So what do you need for a good result? Well, you need plenty of static deflection in order that the natural frequency of the suspension is low – certainly below 2.5Hz, which means not less than about 38mm (1.5 inches) static deflection. However, clearly that minimum figure limits droop capability quite a lot. (Sometimes, eg in the back suspension of front-wheel drive cars, having short droop capability may not be a handling disadvantage. Flying the inner rear wheel will promote rather quicker changes in direction!) Secondly, to get plenty of static deflection, the spring rate will need to be relatively low, in turn requiring that you have a lot of travel to allow you to absorb bumps without bottoming-out. If you’re designing a car from scratch (or making really wholesale changes to suspension units), it’s important that you keep a long-travel suspension capability. That’s not just so that big bumps can be absorbed but also so you can keep the natural frequency relatively low. This also has implications for ride height – you don’t want the body dragging on the ground on big bumps. If you’re modifying an existing car with the usual springs and shocks swaps, springs that lower the ride height will be stiffer (so the car doesn’t bottom-out on the same size bumps) and so will have a higher natural frequency. In addition to ride implications, this also means the tyres are more likely to get excited by typical road surfaces – requiring strong damping. If you reckon you’ve got you head around all that, think of trucks and buses for a moment. 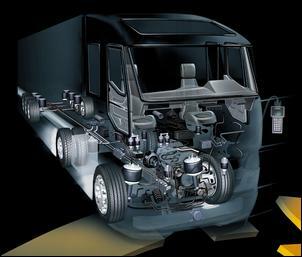 If a truck has a mass acting on the back wheels of 8 tonnes, but can easily have 16 tonnes added in load, the springs are clearly going to have to be pretty stiff to cope with the maximum load. In turn that means a short static deflection in an unloaded state, which means a high natural frequency. And if you’ve ever ridden in an unladen truck, you’ll know how horrible the ride is. But what about buses? Sometimes they might have two people in them (say a 150kg load) but at other times 40 people in them (3000kg load). How do you spec the suspension to give a comfortable ride in both configurations? The answer is with air springs. If you can inflate the springs to always have (say) 8 inches of static deflection, you’ll be able to maintain a natural frequency of 1.1Hz, irrespective of load.